PLEASE NOTE: we are now out of stock on extra propellers and spinners for this plane. You can still order extra motor mounts, and landing gear. Ohhh, yeah. "CADILLAC OF THE SKY! CADILLAC OF THE SKY!!" Remember that movie? How about the end of "Saving Private Ryan"? Who comes to the rescue? The P-51 Mustang, that's who! Want to fly one? To start with, you will LOVE the way this beauty looks just sitting on the tarmac - they got all the lines and proportions to a "T", right down to the big 4 bladed "paddle" prop. And the beauty doesn't stop there - put it up in the air, and you'll see what I mean. This plane is a pussycat and a beast rolled up into a nice little package, flies like it was BORN to fly, and does it all for 8 plus minutes on a 1300 mAh battery! And, once again, our Crashproofing kit makes this plane last through some war- level punishment. We finally did in one test plane in a 50-plus MPH vertical powerdive into cement (believe it or not, only the nose was destroyed...uhh...vaporized in that crash. We still have the rest of the plane, though!) Like all of our videos, the ones of the Mustang show it flying with the Crashproofing Kit installed, so if you were going to ask "How does it fly with it? ", see for yourself! We decided on the Art-Tech P-51 Mustang as our small Mustang (small, in this case, means under 55" wingspan) for a variety of reasons. FIrst, it flies GREAT- like watching the real thing in the air! It handles like a dream, and does all the requisite tricks with ease, like "sit up" and "give me your paw". Meanwhile, our dogs are learning to do an outside loop and the Immelman. Or do I have that backwards? Like all the Art-Tech fighters, it has ELEGANCE written all over it, from the perfetly proportioned nose to the correct dihedral in the wings (that's "up angle" for you beginners), the scale Mustang gear, and the trademark Art-Tech THIN tail section - they use a different molding technique for their fighter tails which makes them very thin, VERY realistic and scale, and STRONG. And now they've got steerable tailwheels, too. The RTF Art-Tech Mustang comes with the plane (I hope so...), 4 channel 2.4 gHz transmitter and receiver (ailerons, elevator, throttle, rudder), the Art-Tech LiPo charger (the one I use daily), a 1300 mAh LiPo battery, and an extra prop, and the tools and glue and all the hardware. The PNP version comes with all of that EXCEPT the Tx/Rx. It DOES include a battery and charger. The ARF version is the plane with no extra stuff. 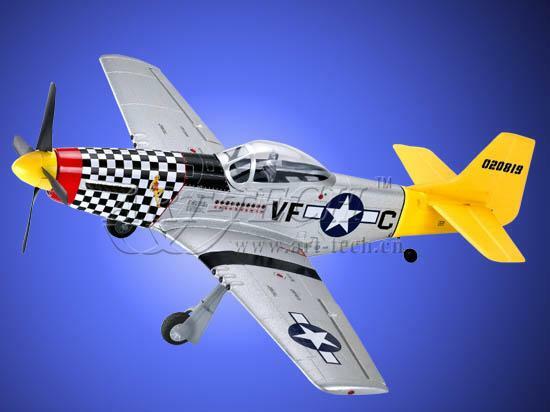 Our "Killer Planes Extra" version of the Art-Tech P-51 Mustang comes with 2 extra props and 1 extra spinner (total), 1 set of extra landing gear, and an extra motor mount. All handy stuff that will cover the most common mishaps and keep you flying! We have the spare parts you'll need for fixing mishaps, and our Mustang Crashproofing Kit. Also, don't forget our "Aircam" for spectacular "pilot's view" flight videos. Did I mention the Crashproofing Kit? Yes? DId you GET one? NO?? Go read up on the "Crashproofing" page, and come back and click "YES" on Crashproofing. You can thank me later.